Our refurbished home The Wellwood Guest House, is a Victorian Manor House built one hundred and thirty seven years ago in 1881. It is a C listed building within the Pitlochry conservation area and was the home of the Mitchell family until the 1940's. Most of the building details are original and still in working order including the wooden, shuttered sash windows. The grand staircase and the cornice mouldings throughout the ground floor, are in themselves works of art produced by craftsmen in a bygone era and worthy of note. 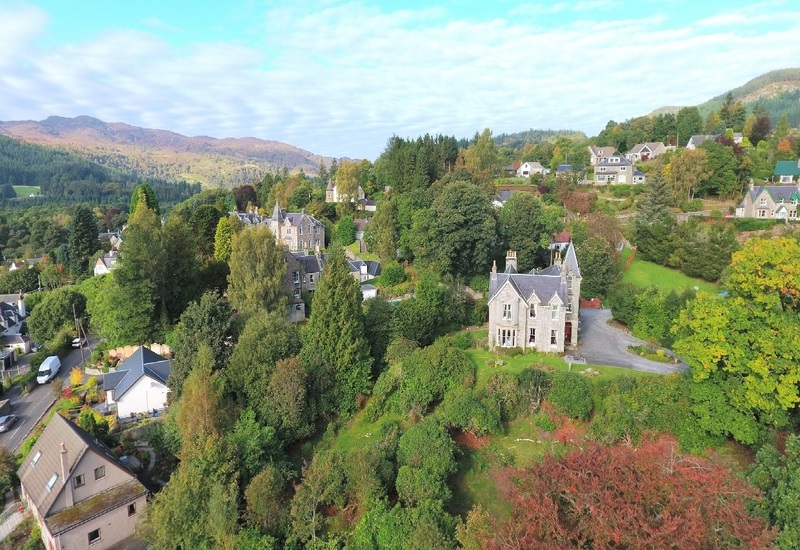 The Wellwood is set in two and a half acres of woodland grounds and, with its elevated position, enjoys panoramic views along the Vale of Atholl and across to Ben Vrackie - the Pitlochry mountain. The Wellwood offers seclusion, peace and tranquillity yet is only three-minute walk from the Pitlochry town centre. We pride ourselves in providing superior accommodation for the discerning traveller. You can enjoy a nourishing start to the day with continental breakfast or our full traditional Scottish breakfast served at your table in dining rooms that overlook the stunning countryside. Later in the day, relax in our lounge, perhaps with a glass of wine or one of our selected locally distilled malt whiskeys or ... just sit with a cup of selected tea or coffees to while away the afternoon. Pitlochry's growth from a tiny settlement to bustling and attractive town can be traced back to a two notable visitors. General Wade, in the early 1700s, built one of his main military routes north through what is now the town. Then Queen Victoria visited the town in 1842 and stayed at nearby Blair Castle. Her favourable comments marked the start of Pitlochry's real growth as a popular tourist destination. In 1863 the railway arrived connecting Pitlochry to the rest of the UK on the London-Inverness line and confirming it as one of the premier mountain resorts in the country. Also easily accessible from the main A9 Pitlochry draws tourists from all over the UK and beyond. The Blair Athol Distillery towards the southern end of the town was founded in 1798, making it one of Scotland's oldest distilleries, and offers a visitor centre. The Edradour, which until the advent of the new wave of micro-distilleries was the smallest in Scotland also has its visitor centre. Lovers of beer rather than malt whisky will find a working brewery in the town, at the Moulin Hotel in Moulin, on the northern edge of Pitlochry. And there are other good pubs to choose from too, including the Port-na-Craig Inn and Restaurant, on the banks of the River Tummel and under the shadow of both the Festival Theatre and the hydroelectric dam. The Dam was built across the River Tummel to create Loch Faskally and includes a "fish ladder", built to allow salmon to make their way upstream of the dam to spawn. Visitors can actually see the fish making this supreme effort at the right time of the year through glass walls in the ladder. The Pitlochry Hydroelectric Dam and Fish Ladder here tells the history of hydro-electricity in Scotland and explains how "power from the glens" is harnessed at Pitlochry to produce enough clean electricity for 15,000 homes.